Obedience Programs - "Training humans one dog at a time." Place - known as the "crate without walls" your dog will go to a specific mat, lay down, stay and must have 2 paws touching the mat at all times. This command is used to work your dog even when you are eating dinner, watching television or have visitors. Behavior Problem Solving - covering unwanted behaviors such as; jumping, barking, nipping, aggression, running away, leash pulling, etc. * At Canine Manners we do not believe in hourly rates. Instead, we provide packages and training sessions that do not put us on a time limit. Whether training at the Canine Manners' farm, downtown or in your home, your session is not over until your questions are answered and you understand the "homework" you need to accomplish. We want to make sure you understand everything for each session and will NEVER look at a watch. In fact, we dont even wear one! 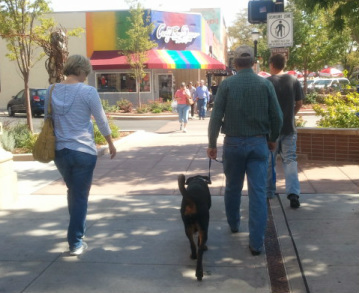 Fritz taking a stroll in downtown Grand Junction. 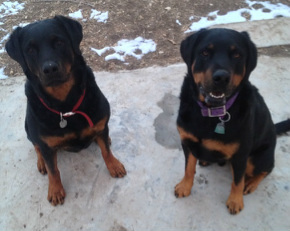 This program is designed for those who have the time and patience to train their own dog. With the guidance of a Canine Manners certified trainer, you will be taught how to work with your dog at your home, with distractions, and especially out in public. Some in-home obedience programs will also prepare you to pass your Canine Good Citizen (CGC) or Therapy Dog International exams.Your scheduled lessons in your home, public or at the farm, will take place once a week or at the convenience of the owner. We want you to take your time and have all homework done before we meet again. We firmly believe that your scheduled lessons are very important and want you to get the most out of each of our certified trainer visits. This program is designed for the owners who may not have the time or patience to be able to work with their dog. These programs are best suited for hyperactive behavior, aggressive tendencies or difficult behavior problems with your canine friend. When you choose one of our residency programs you will know that the training of your dog will be accomplished in a timely manner without inconvenience to the owner. Sasha doing "place" with the distraction of horses and a cow. A certified trainer will talk to you about which program may best suit you upon understanding your situation. 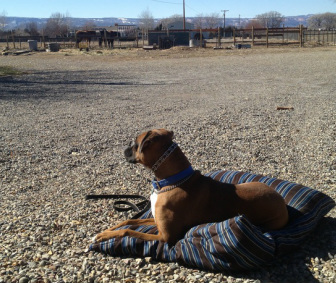 Once a plan is in place, owner and trainer will set up the time to bring your dog to the farm. Once completion of the residency program, owner and trainer will set up private sessions located at the farm, in your home and out in public. These sessions are designed in order for the owner to understand how to work with and control his dog with the commands he/she already knows.